I am not a party girl so creating a party worthy look is actually quite challenging with my closet overflowing with pastel and florals. 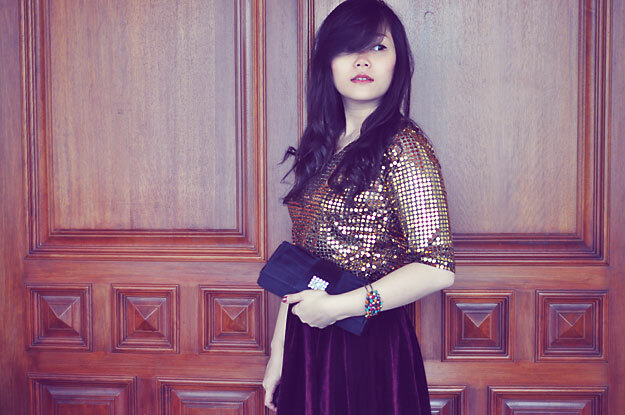 This sequined top is a fun way to look instantly festive while the maroon velvet skirt creates a glamourous vibe. Top is thirfted, velvet skirt c/o Oasap.com, bracelet and clutch c/o Laku.com, tattoo tights (so many cute designs!) c/o Romwe, while shoes is Zonzo. Mine is most likely pretty much the same as last year, which is a good night sleep. Yup, that's how wild I am. OMGosh those tights ARE really cute! Thanks for the link! I'm gonna check them out! Ahh, those tights are adorable! I like this sequined top. The shine isn't as brilliant - more like a dull kind, but it's really lovely still. Whoaaaa I love the tattoo thights! you look so pretty ! i love the tights ! the tattoo thights make the whole outfit look unique! i love it. and oh, merry Christmas! The velvet skirt is fab! You look so pretty! And your skirt is amazing! Aw this is definitely a perfect outfit for a New Year's Eve party! I love the sparkly top and your pretty velvet skirt.